Good morning. The weekend is close, but spare a thought for the world’s tireless G20 leaders. 1. In Asia, Shanghai dipped back a little to 2,486 down 0.34% but stocks in Hong Kong rose by the same percentage, taking the Hang Seng to an almost two-month high of $24,020. But in Japan, the Nikkei was up nearly 200 points or 1.14% to 17,393, another post-2007 high as talk of a snap election grows. 2. Locally, after another down day on the ASX – the fourth in a row – Dec SPI 200 futures were up 4 points to 5,451. With no fresh news from the US overnight, no data today, a holiday in Brisbane, a heatwave in Sydney and a reasonable day in Melbourne, traders might clock off a little early. 3. But go easy on the knock-off celebrations. It might be a quiet day for data releases in Australia and Asia but there’s some huge data in Europe tonight with the release of German, French, Italian, Portugeuse and EU wide GDP. EU CPI is also out. And in the US, it’s retail sales. 4. In G20 news, Tonay Abbott and David Cameron are best mates. Astonishingly, the Brit PM has never been to Sydney before! “You’ve laid on some un-English weather for me,” Cameron said after his admission. They had some brekky together and Cameron will head to Canberra this afternoon for the obligatory Parliament address and War Memorial visit before heading for Brisbane. 5. Foxtel wants a piece of Ten. Newscorp chairman Rupert Murdoch has confirmed that Foxtel is looking at taking a stake in the free-to-air Ten Network. The troubled television group has appointed Citi as a strategic advisor after reports that it is under scrutiny by various suitors. “As for Foxtel, which is a partnership with Telstra, they are examining a small piece,” Murdoch told Newsgroup’s annual general meeting in the US. The latest reports say it’s a 14.9% stake in Ten in partnership with the US giant Discovery Communications. Ten’s shares are up around 25%. 6. Nope, nothing to see here. The official line from FIFA’s “release” of an investigation into the bidding for the 2022 World Cup in Qatar surprised no one. Apart from the guy who wrote the report, former US attorney Michale Garcia, who was so horrified by FIFA’s claim it contained no suggestion of any major violations that he’s going to appeal the release. Embarrassingly, while FIFA cleared Russia and Qatar, Australia and England were singled out for trying to dubiously curry favour with FIFA’s executive committee. 7. Clive Palmer loves bit of free stuff. Shortly into a conversation with a talkback caller, ABC Radio host Kelly Higgins-Devine said: “Would that happen to be Clive Palmer?” Palmer replied yes, then gave the correct answer to a question about the G20 leaders. “Would you like a DVD sir?” Higgins-Devine asked and Palmer said: “Absolutely, that’s why I rang up.” He chose a prize of of nature doco DVD about snow leopards. 8. 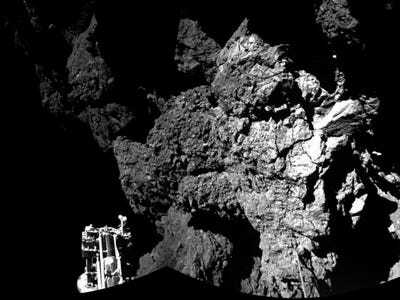 It’s not looking good for Philae. The ESA team is no doubt feeling a little more ill by the hour as it looks like its $1.6 billion comet shot is struggling. Philae has sent back some stunning pictures of Comet 67P, but early data shows it might have bounced on landing and is now stuck under a cliff. Here’s one for the space fans – it took nearly two hours to come back down from the first bounce. The real bad news is that Philae might be in the shade and getting just 1.5 hours of sunlight a day. It needs 6-7 hours to stay powered up. 9. Dude, where’s my $1 billion? A popular currency trading website that gained popularity with small investors suddenly disappeared earlier this year, and could have taken more than $US1 billion with it. In it’s brief life, Secure Investment grew quickly to be at one stage more popular than forex.com. Many, many small investors were lured to the site by as many as 54 testimonial videos from people who – shock – were actors, not actual investors. Customers were asked to transfer funds to banks all over the world and watched their ROI grow, but were fobbed off with excuses when they attempted to withdraw the money. It went offline in April 30 and there’s still no sign of it coming back. 10. Uber is incredible. The digital taxi service is raising money again and the numbers it’s put out as bait are off the scale. Its gross revenue is expected to hit $US10 billion by the end of next year, equating to $2 billion of net revenue. That means the $US18 billion valuation put on it from last summer would be about 10 times forward net revenue, well within reasonable range. And even at that size, its growth is still pegged at 300% this year and another 300% next year. But wait, wait – most of that cash is from 10 cities and Uber is now operating in 150 cities, meaning it’s got an enormous amount of business maturation ahead of it. Just, wow. Have a great weekend. I’m on Twitter.